Beer Fellows: Witbiers: Our segue into Pilsners...what? So it is not a perfect segue by any means but witbiers do have one thing in common with the pilsners we are about to look at during this month of May. They make great refreshing summer beers. A brewing saint who resurrected an entire style of beer. So what is a witbier? 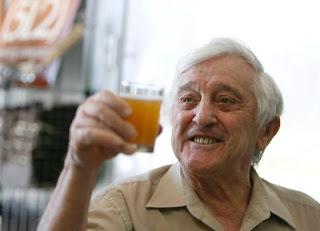 For starters it was almost a style of beer that went extinct until the intervention of a man named Pierre Celis came along and single-handedly revived it back in the late 1960s. If I was doing this right I would have grabbed a Hoegaarden, that was the beer Celis brewed that reintroduced the world to the joys of witbier. It is an InBev product now and has been for twenty plus years so I can't say how accurate it is to Celis's original brew. It is still a tasty brew though. Another peculiarity of this style of beer is it is not exactly the easiest of beers to brew, we are dealing with unmalted wheat and that requires some more effort from the brewer to become a workable brewing substance. On a side note witbiers were also an early favorite of mine as I started my beer journey. Our classic style from Belgium is the St. Bernardus Wit that comes in at a very drinkable 5.5% ABV. (This is part of the Pierre Celis Signature Selection so there is that.) Since we aren't really dealing with hops here the gruit is more subtle than other wits I have had. The spices, coriander / cloves/ orange are there but they are background scenery, and not trying to hog the spotlight. It poured a hazy light yellow with a small head and it drank very smoothly. It has a pleasant fruity taste with the spices coming more to the front as you swallow the beer. They do stick around and take a curtain call in the aftertaste. Overall this is an excellent refreshing, light on the palette and rewarding beer. I wholeheartedly recommend this. This is a perfect beer to convert drinkers into the craft beer world. I was going to do a review of my local's version of a witbier, Port City Optimal Wit, but a different bottle was calling my name and Optimal Wit will have to wait for its day in the sun. (It is a solid beer in my opinion.) Our "nouveau" witbier is actually from Japan. It is the Hitachino Nest White Ale. We've had Hitachino Nest beer before around these parts with good results. One caveat going into this. I have had this bottle since October 2011 stashed away in my cellar. That said let's dive in. This poured a clear straw gold color with a big spicy nose. This should have been an indicator that something was amiss, but I didn't pick up on it right away. On the drink this is smooth on the tongue but loaded with spice up front. It does clear off the palette very quickly with minimal aftertaste which is opposite to the St. Bernardus Wit. It was the lack of body that had me puzzled though. I expected more. Then a light bulb went off and I realized that since I had stored this for the last 8 months everything has settled. Sure enough there was a big layer of sediment at the bottom of the bottle. Here is where beer purists may wish to stop reading for a moment. I shook the hell out of it for a few seconds and voila, a beer with body that was much closer to what I expected. This is a very drinkable 5% ABV. If you can find a bottle of this I would encourage you to pick it up. It is a refreshing and enjoyable witbier. A refreshing mildly hopped Belgian styled beer with a complex flavor of coriander, orange peel, nutmeg. White Ale has won gold medals at several beer competition in U.K. and U.S. So after a weird month of Belgian beer I think we can walk away knowing we barely scratched the surface of the ridiculous awesomeness that is Belgium's contribution to beer. There is an exoticism to these beers but that does not take away from the fact that many of them are very approachable and can be rewarding to a beer drinker. These top tier beers have had a huge impact for the better of the craft beer world.